조선시대에 성저십리(城底十里)라고 불리던 도성 밖 약 10리에 이르는 서울의 행정구역은 일제 강점기 후반인 1939년에 일제의 군수산업 기지로 개발된 영등포 지역이 서울에 편입되면서 134㎢로 확대되었다. 그리고 해방 후인 1949년에 서울은 서울특별시로 승격·개칭되었고, 이후 행정구역을 확장하면서 면적이 268.35㎢로 증가하였다. 1963년 서울의 행정구역은 인근의 경기도 지역까지 대폭 확장되어 전체 면적이 613.04㎢로 2.3배 증가하였다. 1973년에도 경기도의 일부가 서울에 편입되면서 서울의 면적은 627.06㎢로 증가하였다. 그 이후 서울은 자치구를 새로이 신설, 조정하면서 행정구역 면적이 소폭 조정되었고, 실측으로 인해 면적이 재조정되었다. 2010년 말 현재 서울의 면적은 605.25㎢에 이르고 있으며, 동일시점의 국토면적(100,033㎢)에서 약 0.6%를 차지하고 있다. Seoul underwent the first massive expansion of administrative area in 1939, during the late Japanese colonial period, when suburban area of the city was expanded to 134㎢, with the development and integration of yeongdeungpo area as a Japanese military industrial complex. Seoul's administrative area grew further after independence, when it was promoted and renamed as Seoul metropolitan City in 1949 and expanded to 268.35㎢. 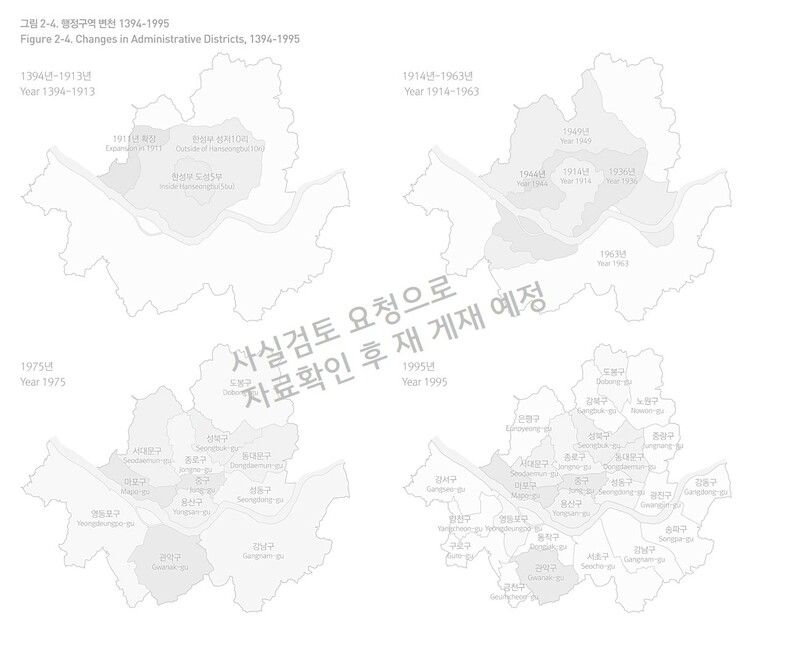 Since then, the administrative area of Seoul expanded into nearby regions in gyeonggi-do, as the total area grew by 2.3 times to 613.04㎢ in 1963, and to 627.06㎢ in 1973. After the creation of new districts and further surveys, the area of Seoul scaled back to 605.25㎢, as of late 2010.